Conan O’Brien has taken over The Tonight Show, and, my, what a beautiful set they’ve built him. Conan O’Brien is something of an acquired taste. I remember how bad Late Night with Conan O’Brien first was in 1993 when it premiered. It just seemed flat-out amateurish. But Conan got a lot better, and gradually I became a fan. For a while, from probably 1999 to 2004, I watched Conan almost religiously. I gradually gave that up as I had less time and became a regular of The Daily Show (and later The Colbert Report). In more recent years, I’d watch from time to time. I took a look, out of curiosity in January 2008, to see what he’d do during the writers strike. I remember how he grew that beard and made a nightly game out of spinning his wedding ring on his desk. The highlight was when Jon Stewart and Stephen Colbert and Conan engaged in a hilarious mock battle over who made Huckabee. And when Conan had his last week of Late Night back in February, I settled back in to watch. It was like rejoining an old routine. Now Conan has moved on to The Tonight Show. Much discussed has been whether his brand of humor would go over in the earlier timeslot. What seems to be overlooked in that discussion is that people like me, who were in high school when Conan started, are now approaching their mid-30s today. Wouldn’t it makes sense that a lot of that audience might simply, naturally follow along to an earlier timeslot? I’ve been watching since the premiere and I’m glad to see that The Tonight Show with Conan O’Brien is essentially just his old show moved into the earlier timeslot. Old bits like “The Year 2000 3000″ and “Celebrity Survey” have been carried forward. No word yet on Triumph the Insult Comic Dog or the Masturbating Bear (although the latter was supposedly retired — with a question mark — in Conan’s final week on Late Night). The first week of Conan was amusing, though not always hilarious. Hitting Tom Hanks with an asteroid was slapstick genius. His first interview, with Will Ferrell, was something of a disappointment. (Like with Stephen Colbert, all Will Ferrell interviews have become Will Ferrell playing “Will Ferrell.” But unlike Colbert it just feels forced and staged.) Conan has always been hit-and-miss; why should that change with him being an hour earlier? Leno turned out episodes of The Tonight Show like a workmanlike machine — efficient, professional, solid. Sometimes even funny. But also almost painfully safe. Conan offers a slightly more quirky comedy twist, and for that I’m thankful. There’s something about Conan that makes you want to root for the guy. He’s an oddball. His humor comes from a less safe place than Leno. Will it work for NBC in the ratings? Well, probably not. Word is, on Tuesday, Day Seven, Letterman surpassed The Tonight Show in the ratings, something he has never done for an extended period since the early years of the Letterman/Leno late-night wars. Last year, I was engaged in a bit of an internal battle over whether I should watch Craig Ferguson or Conan O’Brien. Conan was what I had grown up on and Ferguson was dangerous and exciting. While Conan was a favorite of mine and my family for so long, Ferguson was able to pull ahead in the polls (me talking to myslef). I often wistfully imagined a world where I could watch Conan and Ferguson without investing in that fancy ‘video recording’. Now my evenings are entirely too enjoyable. Now I can’t complain about watching Leno or Letterman and their old-man ways, so I must find other problems in late night tv. 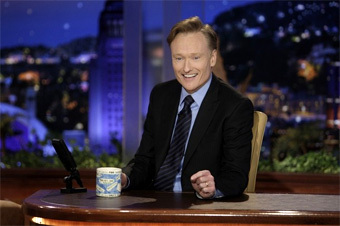 Here are some of the Conan problems I thought of: Andy Richter, and that’s about it. I grew up when Max Weinberg (probably spelt wrong) was Conan’s number one, and it is hard to not see the band leader being an active part of the comedy. Andy Richter has had a few funny moments but they are too far in between his uninciteful ponderings. Oh, and the cross-country sprint had me rolling on the ground. Did they really change it to “the year 3000”? That kind of ruins part of the joke. Yeah, I think they sort of wanted to “upgrade” it. The essence of it is the same, though. Unfortunately, I’m not surprised Conan is losing in the ratings slightly. Leno was very middle-of-the-road, but he was definitely “reliable.” Though I rarely watched him and was a frequent Conan viewer. I definitely prefer Conan’s brand of humor. I’m curious how he’ll use Andy Richter in the future. I think Richter is hilarious and he’s a top-notch writer (I mourn Andy Richter Control’s the Universe), but he’s never found /quite/ the right niche for himself. I hope he finds his groove on the Tonight Show. I’ll always remember Conan more for writing Simpsons episodes than for being a late-night talk show host. Season 4’s Marge vs. the Monorail still feels overtly surreal for a Simpsons episode, even by today’s standards as we finish season 20. He was uncanny and hilarious when he recorded the DVD commentaries for the episodes he wrote. He kept doing impersonations throughout the recordings. And he seemed to draw other writers and producers and their attention. Worth listening to any day. His continuous rant regarding his hatred of old people never got old. Only Conan could make a hyperbaric chamber comment that funny. My fear that when Conan moved to The Tonight Show is that his kind of comedy would change because by all appearences Jay Leno is just as funny anywhere else but on The Tonight Show so I was afraid Conan might conform to NBC’s will. However, I was very pleased to note he hasn’t changed much and thats a great relief though the next few weeks will be telling. I just hope no matter the rateings Conan keeps doing what he’s doing, he just cracks me up. I love Conan. He’s one of the most naturally funny people on television. Some of the best moments on the show are when sketches would go wrong and Conan would just comment on that instead of continuing the bit. If you never saw the Finland episode look it up on Hulu. It’s a great example of a talented guy reacting to the situation with hilarious result. Oh look for old time baseball too.